JUBA, South Sudan (CNS) — Human rights in South Sudan are abused “on the battlefield and in peaceful areas,” and much of the country is without effective governance, church leaders said. 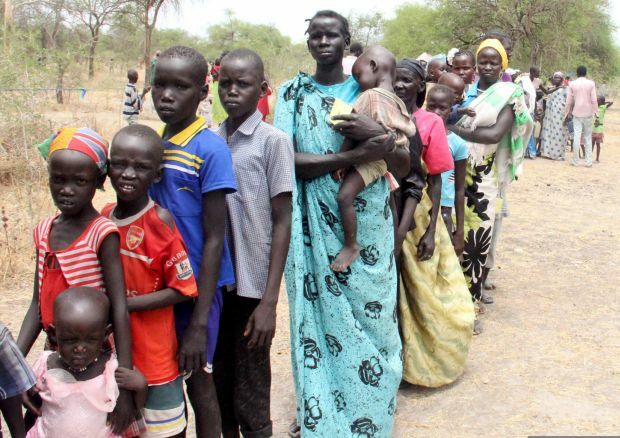 “People are being killed, raped and tortured,” the South Sudan Council of Churches said in a May 26 statement signed by eight church leaders, including Archbishop Paulino Lukudu Loro of Juba. According to the United Nations, fighting in South Sudan has “worsened considerably” in recent weeks. About 119,000 people are taking shelter in its compounds across the country, the U.N. said May 24, noting that rights monitors have been denied access to sites where they sought to verify reports of killings, rapes, abductions and the burning and destruction of towns and villages. The world’s newest state, which gained independence from Sudan in 2011, was plunged into conflict in December 2013 between forces loyal to President Salva Kiir and rebels allied with his former deputy, Riek Machar. As many as 10,000 people have been killed and more than 1 million displaced in the months since. Peace talks, mediated by regional governments, have been held in Ethiopia’s capital, Addis Ababa, but the few agreements reached there have been consistently ignored on the ground. The church leaders said they “seriously doubt” that South Sudan’s military and political leaders, “most of whom call themselves Christians,” will heed their call to stop fighting. “Nevertheless, we want them, along with the citizens of South Sudan and our friends in the region and the international community, to know that we are watching and we are aware of what is happening,” they said. “National assets are being destroyed” and the “economic situation in the country is deteriorating very rapidly, leading to hardship for the ordinary citizens,” the council’s statement said. Separate from the main conflict between the government and the opposition, “we see an increasing militarization of society, with new armed groups springing up and with an increase in conflicts between and within local communities,” it said. “The churches will not sit idle,” the council said, noting that “if our statements are not heeded, we will take more proactive steps to try to achieve peace and reconciliation” for the people of South Sudan. “Any long-term solution to the conflict must take account of the needs of the ordinary people, not the agenda of the political and military elite,” it said. While no one was injured, “all the church personnel were near the explosion” of the two bombs, the bishop said in a message to John Ashworth, an adviser to both the church council and to South Sudan’s Catholic bishops.